Did you know that your body starts making milk during your second trimester of pregnancy? That means you’ve got milk even if you give birth early! Your first milk, colostrum, is like medicine for preemies. It makes sense that newborns need to eat so often: their tiny tummies fill up quickly, and empty quickly, too. 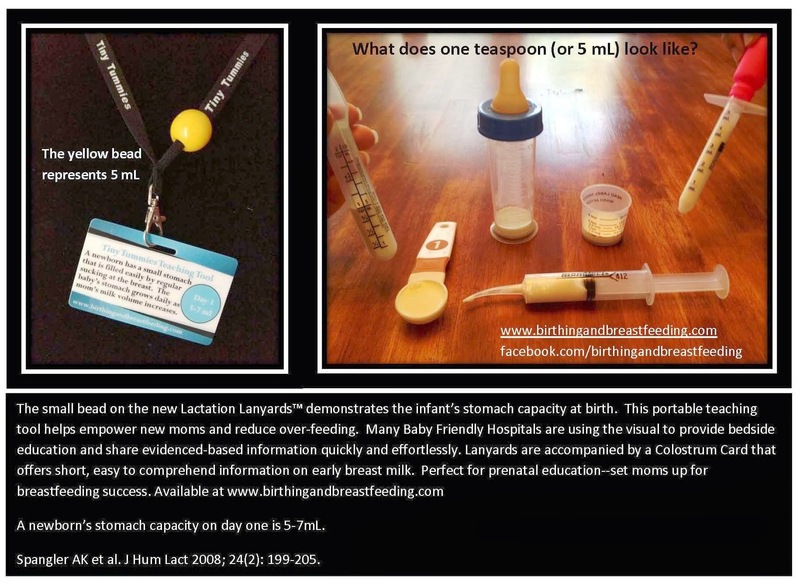 If you and your baby are separated or are having difficulty latching, you can hand express your milk into a teaspoon and feed it to him using the spoon, a syringe (with no needle, in his mouth), or even a cup! Breastfeeding early and often (at least 8-12 times in 24 hours) will help increase your milk volume as it transitions from colostrum into the thinner, whiter mature milk by Days 3-5. Your breasts may feel heavy and warm as they fill with more milk. It is important to breastfeed or express colostrum before it transitions to mature milk. If the milk isn’t removed in those first days, the hormone-driven milk production begins to shut down the “milk making factory” inside your breasts. Breastfeeding frequently also helps babies lose less weight and have lower bilirubin levels. Keeping your baby skin to skin against your bare chest has been shown to increase milk production, too. Your baby might even bobble himself down to latch on his own while you’re holding him skin to skin! By the end of Day 3, your baby will drink half an ounce to an ounce (15-30ml) of milk per feeding. As he feeds more often, his tummy grows, too, and so does his diaper output! On Day 1 expect to see at least 1 wet diaper and 1 sticky, tarry, meconium bowel movement in 24 hours; on Day 2, we expect 2 wet and dirty diapers. When you see at least 3 pees and 3 green poops in 24 hours on Day 3, you’ll know your milk production is increasing. The bowel movements should be a seedy, mustard yellow by Day 4-5. What goes in must come out, so if your baby doesn’t have at least 3 bowel movements by the end of Day 3, or if they’re still that black/brown meconium color, or if they’re green on Day 5 or beyond, please call for breastfeeding assistance. Sometimes just changing the latch or adjusting the way you’re holding your baby will get more of your breast into your baby’s mouth for a better feeding to get those poops moving! Sometimes, milk transitions from colostrum, or “comes in,” a day later for first-time moms. Other mothers may have risk factors for delayed onset of lactation, too. Some factors include lots of IV fluid during labor and delivery, a traumatic birth, retained placenta or hormonal issues like polycystic ovarian syndrome (PCOS) or insulin resistance. Not removing milk often during the early days may also delay full milk production. Most mothers can make enough milk for their babies. If you’re concerned about your milk production, please call us, or find an IBCLC or La Leche League Leader in your area for support! Did you know your increased milk volume can be seen by your baby’s increased diaper output in those early days? How were you able to tell that your milk “came in”? How Does Bottle Feeding Increase the Risk of Obesity?